The tibia is the big bone in the lower leg. A tibial fracture is the most common injury of all long bone fractures and takes a variety of forms but usually involves a long period of immobility and long recovery time. What is a tibial fracture? 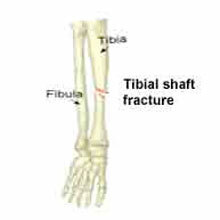 Tibia fractures are normally caused by trauma. Whether a sporting injury, a fall at home or a fall at work, the tibia can have a variety of complex injuries that often involve the knee and ankle as well. Fractures include a break to the tibia (the load-bearing bone) and often the fibula (the thinner lateral bone of the lower leg). Fractures can be proximal (upper), mid or distal (lower). Full recovery takes at least a year and sometimes two. Description: Straightforward tibia, and often fibula fractures, are mid-shaft breaks that are not displaced, which means that the bone stays pretty much in line and can, therefore, heal with little intervention. They’re what you imagine a simple break to be the bone breaks in the middle but doesn’t move very far. Treatment: These are often treated conservatively with a full leg cast for usually 4 weeks followed by a below knee or patella tendon bearing cast for a further 6 weeks. The patient will be non-weight bearing for the first 4 weeks and will gradually start to increase load over the next 6 weeks. Problems: Immobility for 12 weeks can be a real issue. Patients cannot drive, will find simple things like going upstairs or normal daily functions very difficult. The leg muscles rapidly waste away and the hip, knee, and ankle will become weak and stiff. Description: These are more complex fracture types that may need stabilizing surgically. Fractures where the bone juts out and the two parts aren’t in-line (displaced), which shatter the bone (comminuted) or are caused by twisting the bone (spiral) are amongst the type of fractures needing surgery. Treatment: Often associated with larger displacements of the fracture and treated by inserting an intramedullary nail (a metal nail is also known as an ‘IM nail’) into the tibia to hold the fracture in place or the use of an external fixator. N.B. The simple fractures that do not unite will also be treated this way. There will be at least 12 weeks of gradual progression from non-weight bearing to full loading. Once the fracture is healed the metal work is removed. The IM nail will be removed after 3-6 months or sometimes longer. Physiotherapy is essential from the start to reduce the deterioration of muscle tone, to aid mobility and to lessen the stiffness around the ankle and knee. With both these types of procedures, the knee and ankle will become weak and stiff and long-term outcomes often depend on how the patient mobilizes these joints from an early stage. The long-term aim of treatment is to reduce the effects of potential arthritis of the ankle or knee due to the injury. Problems: All surgical procedures have their risks and the most common is an infection. Regular hospital check-ups and further surgery at a later date to remove the metal work will be needed. Immobility is prolonged and driving or walking is restricted for longer periods. Description: These are similar to moderate fractures but tend to be more serious or complicated. Multiple, comminuted, compound (breaks skin) and those involving fractures through the ankle joint or the tibial plateau, which is the bit at the top of the bone just below the knee will often need more intensive treatment. Treatment: These fractures are treated surgically to try to ensure the best possible outcome for the leg that will include the ankle or knee. Immobility is prolonged and recovery is not likely for 18 months. The knee and ankle are the important concerns and early physiotherapy will help to address the mobility of these joints. Long-term impairment can be an issue without appropriate advice. Problems: Fracture healing will take longer and can often be an issue for up to six months whilst the patient is still on crutches. Ankle and knee outcomes are a concern, as the patient often experiences long-term problems and restrictions due to the complexity of the fractures. These patients will rarely return to contact sport. Full recovery from a tibia fracture can take a year or possibly more. Things can get complicated if the fracture affects other parts of the leg, like the ankle or knee. In some cases, patients can be left with a permanent disability if the post-operative or post healing phase of rehabilitation is not appropriate. Early physiotherapy is absolutely essential in all treatments to prevent muscle wastage and reduce the loss of power and function in the knee and ankle. Early active muscle re-education from day one aims to minimize loss, encourage tone, increase blood flow and reduce swelling and stiffness. Early weight bearing, as pain allows encourages bone growth (callus formation) and speeds the fracture healing rate. Rehabilitation encourages movement. Sitting in the early phase is unavoidable due to the restrictions of movement but it creates deconditioning of the musculoskeletal system. Early regular movement of any kind is encouraged. Long term outcomes are improved with appropriate early rehabilitation and guidance. In the early stages, progress is made with walking and lower leg muscle & joint exercises. All of these fractures will take a full year before a return to full activity and the more complex types will never return to contact sports. The key for a good outcome is to start rehabilitation as early as possible, but have expert advice to guide you through the stages of rehabilitation; with these fractures, rehabilitation plays at least 50% part of the recovery process. Below is a rehabilitation framework that will give patients a rough guide. The following is an example of a tibia fracture rehab program and is a guide only. Always check with your doctor or physiotherapist before attempting any rehabilitation. Non-weight bearing and walking with crutches. Early quads and hip exercises. Change of full leg cast often to below knee cast. Knee bending activity getting the quadriceps restored. Slowly increase weight bearing as pain allows. General upper body and overall fitness. 8 week check often more X-rays and a further cast or review of metalwork. Aim for full weight bearing 10-12 weeks. Encourage active rehab from 8 weeks +. Work on knee and ankle mobility. Balance and muscle tone are areas that affect longer-term disability.